See You Space Cowboy is the titular theme of this space odyssey action show, Cowboy Bebop. Earning bounty rewards is one of the few profitable jobs outside of crime in the solar system - and Spike and Jet are just doing their work as they get mixed up with even more interesting people. Eventually we see that almost everyone has some sort of interesting history in this show. Follow the story of bounty hunter Spike (and his companions which turn out to be a black pilot, a female thief, a young hacker of questionable gender, and a tiny pooch) as they live in a world where a hyperspace accident has made Earth all but uninhabitable. Their spaceship is called Bebop and they are bounty hunters: thus Cowboy Bebop. 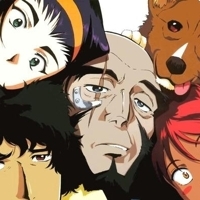 10439 users rated Cowboy Bebop [TV].